Join the discussion on our forums! Come discuss EVIL Miscreant over in our dedicated EVIL Miscreant discussion topic. 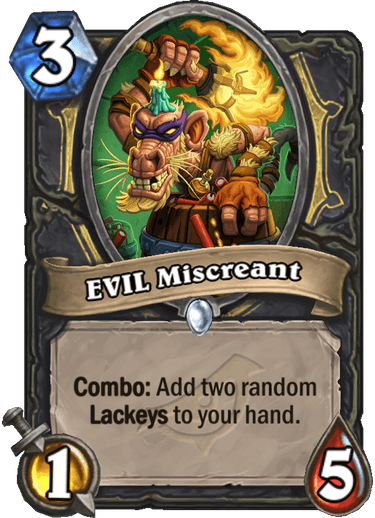 Combo: Add two random Lackeys to your hand. I trully believe that this one is the most broken card of the whole set. Rogue. 1-attack. 3-drop. Combo. Facepalm. Xaril, Poisoned Mind no one playing it in a half of the decks, i'm use it because i like it! But 1/5 stats of EVIL... Let Chakki remove Preparation from standart format or even nerf it for 2 mana, there will be more players in HS, especially old players. You did a survey recently, and not get it ? Hope u read a half of comments. Chakki suggested remove Preparation from standart, before he ajoined Blizz team (u can find this info in itnternet).